Materials: Macassar ebony and Asian ebony with mineral inlay. Finished with shellac (food safe). Comment: In China many categories consist of five elements. There are five seasons that include a dry summer and wet summer (monsoon). Each season has an associated spice and each spice excites a particular taste sensation. These five containers depict the same cherry tree branch through the five seasons and hold each of the Chinese five spice ingredients. 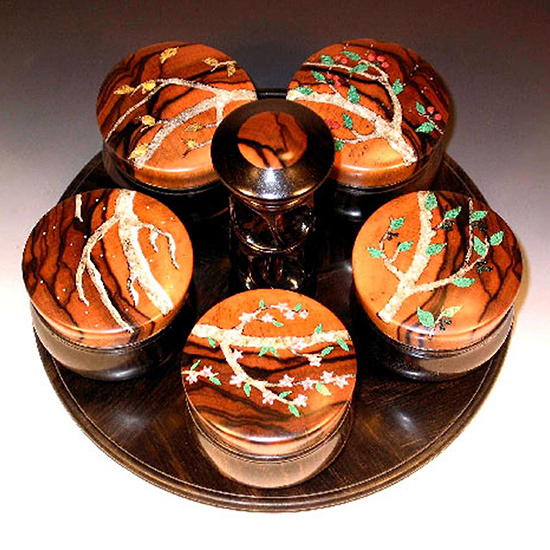 The sapwood and hardwood patterns allowed me to create a circle with the container lids thereby depicting the cycle of the seasons and the cycle of life.